For as long as I can remember I have always wanted to have a 'green thumb' and grow my own food. For as long as I can remember I have always failed spectacularly at it. Over the years I have watched/stalked friends, neighbors, and acquaintances who were able to successfully grow lovely plants and beautiful veggie crops with envy. "How are they doing it?" I would ponder. "what on earth am I doing wrong?" I'd ask. I faced lots of challenges such as trying to grow in dirt that was basically hard clay, and having basically no knowledge about feeding plants nutrients or how much to water. After a few failed attempts I gave up. 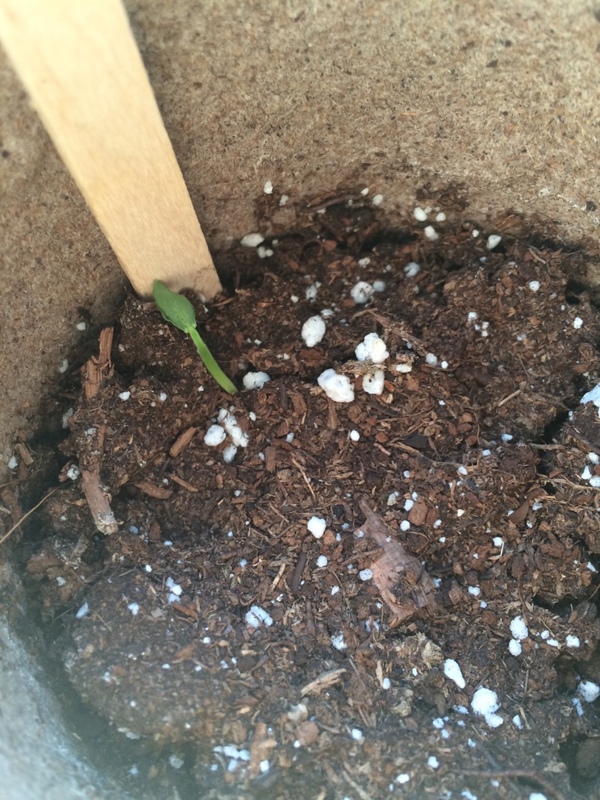 Fast forward to when we moved into our new home, and I decided to give this veggie growing thing another chance. It was the beginning of our first summer there and I was excited to give it another go. My family was skeptical. "Haven't you already tried this before?" "Why throw away all that money buying plants that wont grow when you can buy vegetables at the store?" "why put in all the effort?!" etc. etc. I didn't let it deter me though. After all a gardener is technically the ultimate foodie - you are literally GROWING your own food! Cant get much Hipster than that! 😉 So I decided to go out and buy a few packets of seeds, a few baby seedlings, some pots and some dirt, and just see what would happen. Though we had a huge backyard, it was a total mess - overrun with tall grass and weeds - so I decided to start small and just plant in a few pots. To my surprise (and utter delight !) I was finally able to grow some edibles! :) I was really excited!! I managed to harvest a handful of zucchinis and cucumbers, 2 green peppers, some radishes, and a whole bunch of tomatoes! Now to any mildly experienced gardeners this would not seem at all impressive, but for me it was amazing! I had finally managed to grow something! Sure, my cucs and zuchs plants all died after a tiny harvest. I dealt with blossom end rot on some tomatoes (after I figured out what blossom end rot is) and only got like 2 bell peppers, but still. Progress. Mistake # 1: I thought it would be a clever idea to try growing radishes in recycled egg cartons. I mean you only need a few inches for radishes right? Wrong. It was an utter failure. LOL Radishes dont need that much soil, but they still need at least a good 6 inches I would say! Back when I didnt know what these evil bugs were. Not only do they kill your plants, but they also have no manners and will get their freak on in the middle of your cucumber plants. Rude. These are beans that grew in between those row of tomato plants I had planted (in early pic). Weirdest part? I DIDN'T PLANT ANY BEANS.....Nature you crazy. Long time no post! I'm so very sorry. Seems like I'm failing on those new years resolutions already! *fail* But I *do* have a good reason! Kinda. Sorta. See back in late January I ended up taking a very last minute (I'm talking a few days notice) 3 week vacation, which made it really difficult to update regularly! Not for lack of trying though! I had even prepared a Valentine's day recipe and a DIY craft, and photographed it all the night before my departure and was planning on posting updates while on my vacation. Unfortunately I ran into some unforeseen problems with internet connection while I was there – I was promised high speed wifi and was left with internet that wouldn’t even connect! Alas, after many, many, many frustrating attempts to connect to the interwebs I took it as a sign from the universe to just chill and actually *be* on vacation. So I did! However, when I got back I ended up getting really sick (caught something awful on the plane ride back), and then drowning in work (it happens when you take 3 weeks off). After all that, life caught up with me and things have been really busy, and before I knew it its been 3 months! So in order to make it up to you, here's a recipe for a super easy and super delicious Triple Berry tart which really signals that summer has arrived!! If you have been super busy like me, but need a quick delicious dessert, that also makes a statement, then look no further! This is really great for when you want to make a great homemade dessert for a party or special event, but don’t have the time (or just feeling too lazy) to make anything too complex. And what with the crazy heat of summer well on its a way, its a great dessert to take to your neighbourhood bbq which has the added bonus of not needing to turn on your hot oven! This tart can easily be changed and customized in endless ways to whatever fruit you have whether it be different types of berries, or perhaps banana slices, or kiwi, or even some peaches! You could even change the pudding flavours! 1. Break up your graham cracker cookies into smaller pieces by hand, and then place in to a ziplock bag. Seal firmly. And bang it with a rolling pin! (great therapy! lol) keep banging it until its nice and crumbly.Once completely crushed pour crumbs into a large bowl. If you don't have cookies but rather the crumbs, this should equally roughly 1.5 cups, so measure that and pour it into a bowl. 2. Add your sugar to the crumbs and mix until throughly incorporated. Then add in your melted butter and mix! Depending on a variety of things you may need a bit more cookies or a bit more butter. You want to be able to mix it to the point where it becomes like sand that will hold its shape when squished down. 3. Take your tart pan and press it all down in the pan to form a crust. Place in the fridge to set for a few hours. 4. Prepare your fruit topping - wash and slice! 5. Once the crust has set in the fridge, prepare your pudding mix by mixing the required powder to milk mixture called for on the box. It will be liquidy at first but if you keep mixing it will thicken! Pour your thickened pudding mixture into the tart. Decorate with Fruit. Place in fridge to set until ready to be served! About a year ago I noticed a growing trend of doughnut recipes everywhere on the internet. Cool! I thought. I didn't realize making doughnuts at home was so do-able. But seeing as doughnuts aren't the healthiest of things, and I was at that point in time trying to lead a more healthier lifestyle, I decided to not really 'look into' this trend. I mean doughnuts are basically sugary dough deep fried in oil - not exactly healthy! Then, last winter, during a quick trip to Michaels to buy some arts and crafts supplies, I happen to pass their baking aisle, where I noticed something pretty cool! A doughnut baking pan! I had never seen one before and all of a sudden I realized...aha! maybe all those doughnuts weren't fried. Maybe there were baked! And thats when it dawned on me. OH MY GAWD I NEED TO MAKE DOUGHNUTS. However, being in a hurry I decided to come back for the pan another time (I mean there were like ten of them so what were the chances of them selling out?) So I came back a week later to pick some up when I found out they had sold out! (I guess the chances of them selling out wasn't so far fetched after all huh?! :( ) I called two other stores in the city and none of them had any stock either! It ended up taking me a good 7-8 attempts before I was finally able to locate a pan and buy it. By then anticipation had grown and I was super excited to make those darn doughnuts already! So I ended up using a recipe that came with the pans and they turned out.... *drum roll please*....pretty horribly. Yeah. It was kind of a bit of a let down. Well a big let down considering all the time it took to locate the darn pan in the first place! I figured, hey, maybe theres a *reason* doughnuts are fried and not baked - maybe the reason is they turn out pretty gross! So I gave up and packed up my doughnut pan and put it away in storage. Then I stumbled across said pan about a week ago as I was looking for other things in storage, and I decided to give this baby one more chance before exiling it permanently into the land of unwanted things. I searched all over for a good recipe (you know, to give the poor pan a fighting chance) and gave it a shot. I found this cinnamon sugar doughnut recipe and hesitantly gave it a shot. And it was SOOO GOODDD. OH MY GAWDDDD. Its unbelievable delicious. Like melt in your mouth amazingly perfect delicious. Seriously. The doughnut pan had been redeemed. Turns out it wasn't the baking that made the doughnuts gross but the horrible recipe I used! So if you are looking for a pretty simple baked doughnut recipe that tastes amazing look no further! Mix together all of the dry ingredients (flour, cornstarch, sugar, baking powder, salt, cinnamon, and nutmeg) in a mixing bowl. Set aside. In a small bowl, whisk together all the wet ingredients (buttermilk, egg, melted butter, and vanilla). Grease your doughnut pan really well and pour the batter in to the pan. Bake at 375° for 11-12 minutes. Let the doughnuts cool for a few minutes in the pan, then gently remove and place on cooling racks. Melt your butter for the topping. While still warm, brush all sides of each donut with melted butter, then dip in the cinnamon sugar mixture until well coated. I don't know about you and where you live, but here in Canada, winter is in FULL force. Just last week we had over 20 cm of snow fall in one day, and the windchill has us in the -20 range almost every day. As a result, cold and flu season also happened to be out in full force too! It feels like everywhere you go people are coughing and sneezing in your general direction, from the coworker at work to the cashier at the grocery store, the unmistakable sniffle and cough are everywhere. I've been trying my best to steer clear of a cold because really, who has time for that? Aside from chugging Vitamin C like its nobody's business I have also been trying to incorporate healthier and more nourishing foods in my diet that tend to have great anti viral properties such as garlic and onion. Onions are really high in antioxidants and possess anti-inflammatory properties. Apparently onions are extremely high in the antioxidant 'quercetin'. Quercetin helps the body fight free-radicals, and boosts the immune response. A recent study from the British Journal of Nutrition showed that individuals who ate foods high in quercetin (onion soup was used in the study), had better immune responses and less likelihood for cardiovascular disease . So if you are looking to boost your immune system to avoid catching cold from icky sickly people, or if you unfortunately have come down with something and you are one of those sickly people, try this delicious soup to get you back to your normal self sooner! 1. Begin by preheating your oven to 400F to roast your garlic. Cut off the top of a full head of garlic, making sure to go back and snip off the tops of the cloves you didn't catch (just a tiny snip to expose the garlic will do!). Place inside a square of aluminum foil and then pour some olive oil on top (it will get absorbed inside the cloves) and add salt and pepper to taste.Then wrap up the garlic and place in the oven for 40-45 minutes until the garlic is soft when you poke it with a knife. Then allow to cool completely before removing the garlic from the peel. While the garlic was baking I proceeded to the following steps. 2. Melt the butter in a large soup pan on medium high heat. Add the onions and cook until they are translucent. Add flour and cook for 1 minute (do not brown). 3. Add chicken broth, milk, cream, and thyme. Allow soup to come to boil then simmer for a few minutes, whisking until nicely blended. 4. Add peeled and diced potatoes (make sure they have been chopped into small pieces so they cook faster!). 5. Once the potatoes have cooked (you can tell by poking them gently with a knife - if it goes in really easily it means its cooked), add in all of your roasted garlic cloves and shredded cheese. Using an immersion blender, blend all the ingredients until smooth. Add salt and pepper to taste. Keeping up with my (and probably many other's) New Years Resolution to eat healthier, I thought I would kick of my recipes for 2016 (woah, its weird. Its 2016 now...no more 15!) with something healthy. And what's more healthy than salad? Its basically a bowl full of veggies. Well the only thing healthier would be if it had fruit right? WELL IT DOES! Whaaattt. That’s right, an apple a day will keep the doctor away, so this salad with veggies AND apple slices should more than do the trick! Now for most people the concept of putting fruits in with their salads is not a foreign one. Lots of people add fruits like apples and strawberries and clementine to their salads. These are the people I usually silently judged – I mean it’s a SALAD. All veggies. No fruits. Why are you ruining it? But recently that all changed when I was forced to try a salad with apples at my work place's local bistro. I was running late on grabbing lunch, and at about 3 pm, you take whatever food they have left to sell to you. So I begrudgingly bought it, wrinkled my nose at it, and sat down to eat. And oh my god! I was very pleasantly surprised at how good it was! I was definitely not anticipating liking the sweetness of the apple in the salad (for me a salad is usually lemoney/garlicy/ savoury thing), but I really did! So much so I decided to come up with my own recipe. And so here it is: a healthy Apple Feta Cheese Spinach Salad! Recipe Review: The best part about this salad is that it comes together real quick and easy and only needs a few ingredients. The rest of my family, like myself, were originally pretty skeptical of a fruity salad, but once they dug in they ate THE ENTIRE serving of it in one go! I would call that a success! The dressing is also really great as its not only really healthy, and fresh, and homemade, it's also pretty yummy. It’s got a nice balance of sourness and sweetness to counteract with the rest of the salad. We will definitely be making this a staple into our family's rotation. Toss together all of the salad ingredients. (yes it's that simple, it is just a salad after all! ;) ) **note: If you are using onions that happen to be very sharp (mine caused me to start crying a river with the first slice) you might want to run them under cold water for a few seconds to get rid of the bite. Usually I enjoy the bite of onion in my salad but since this one has fruit in it you might want to tone it down. Up to you though! And as part of my new year's resolution to learn more about what I'm eating, heres the nutrition info for this salad! If you make it into 6 servings (I calculated it as 6 big plates worth of salad), each serving only has roughly 300 calories, 20 grams of carbs, more than 4 grams of Fibre, and approximately 8 grams of protein! This makes it a healthy low carb / low GI (glycemic index) salad. The extra health benefits: 1 serving gives you whooping 42% of your daily Vitamin A intake, roughly 30% of your Vitamin C, 18% of your calcium, and 14% of your daily Iron intake. *Average approximation as the exact brands of ingredients you use could be different. This is based on a 2000 calories/day diet. Welcome to Living the Lovely, a lifestyle blog with a focus on living life to the fullest funnest! Take a look around and enjoy a variety of recipes, DIY projects, and much more! Super Easy Natural Homemade Butter!